Congress directed BSEE to make this amendment in the Consolidated Appropriations Act of 2017. A notice of the final rule, titled, Oil and Gas and Sulphur Operations on the Outer Continental Shelf – Lease Continuation Through Operations, is available in the 9 June Federal Register. June 26-30 marked Energy Week for the U.S. White House. During the week, the Executive Branch of the government hosted several panels and roundtable discussions to talk about how state, tribal, business and labor leaders can work toward U.S. energy dominance. In the U.S. Senate, Senators Lisa Murkowski (R-AK) and Maria Cantwell (D-WA) introduced a new version of their bipartisan energy and natural resources bill, S1460, the Energy and Natural Resources Act of 2017. The bill will expedite liquefied natural gas exports, boost energy trade, protect sportsmen’s access, strengthen mineral security, bolster the energy workforce, reauthorize certain conservation programs, facilitate better management of federal lands and minimize risks from natural hazards. The bill’s full text can be found on the Energy and Natural Resources Committee’s website. On 29 June, the U.S. House Natural Resources Committee held a hearing to examine access to oil and gas on Federal lands. At the conclusion of 2016, the Bureau of Land Management, which is responsible for leasing federal owned minerals for oil and gas development oversaw 40,143 onshore leases in 11 states. This is the lowest number of federal leases since the BLM began publishing records in 1985. Duplicative and costly policies have discouraged operators from leasing federal minerals. Between 2010 and 2015, federal crude production fell from 36% of total crude production to 21%, while crude production on non-federal lands more than doubled. At the federal level, the BLM currently has a backlog of 3,000 drilling permits. Witnesses during the hearing included Katharine MacGregor, deputy assistant secretary at the Department of Interior (DOI); Ryan Flynn, executive director of the New Mexico Oil and Gas Association; Dr. Laura Nelson, Governor’s Energy Advisory, Utah Governor’s Office of Energy Development and Mark Squillance, professor of law, University of Colorado, Boulder. The Hearing Memo and video of the hearing can be accessed via the Natural Resources Committee website. “We thank Congressman Johnson for his leadership, along with Congressmen Abraham (R-LA), Higgins (R-LA), Graves (R-LA), Hice (R-GA) and Duncan (R-SC) for their co-sponsorship of the bill. In early June, the Department of Interior announced the addition of key senior staff members including Chief of Staff to the Secretary, Associate Deputy Secretary, Principal Deputy Solicitor and two Principal Deputy Assistant Secretaries. The U.S. Senate has been busy at the Committee level and on the Senate Floor. The Senate Appropriations Subcommittees and Senate authorizing committees have held hearings to review the President’s FY18 Budget Request. The Senate Intelligence Committee held several hearings on Russia’s interference in various elections, as well as received testimony from former FBI Director James Comey and Attorney General Sessions. The Judiciary Committee held a hearing on the Foreign Intelligence Surveillance Act Amendments with a focus on how to balance gathering intel for national security with protecting privacy and civil liberties. In the full Senate, Mitch McConnell put forth the Senate’s healthcare bill but did not have the votes to pass it in July. In addition, the Senate continued to process various nominations, as well as passed S. 722, an Act to provide Congressional Review and to counter both the Iranian and Russian government aggressions. The House of Representatives, the greater WDC community and the country were in shock at the shooting of GOP Congressmen at their practice for the Congressional baseball game. Fortunately, Louisiana Congressman Steve Scalise continues to recover at a steady pace. House Committees have also been busy holding hearings on the President’s FY18 Budget Requests. The House also began work on the National Defense Authorization Act. The House passed nearly two-dozen bills in June, most notably the Veterans Affairs Accountability and Whistleblower Protection Act. On 27 June, the U.S. Energy Information Administration (EIA) announced that crude oil and petroleum product exports have more than doubled over the last six years, increasing from 2.4 million barrels per day in 2010 to 5.2 million barrels per day in 2016. Exports of distillate, gasoline, propane and crude oil have all increased, but at difference paces and for different reasons. On 16 May, the IADC Australasia Chapter hosted its Annual General Meeting in Perth. During the meeting, the chapter presented Safety Awards, recognizing safety excellence for 2016. Winner of the 2016 Onshore Safety Award was Schlumberger Land Rigs and the 2016 Offshore Safety Award was Noblecorp. The award program is open to all onshore and offshore chapter members, with a winner designated in both areas. In 2016, nine of thirteen IADC Australasia Chapter member companies participated in the program. 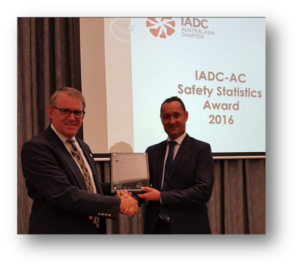 The safety statistics for the participating companies were supplied quarterly in compliance with the 2016 IADC Incident Statistics Program (ISP) guidelines. For more information about the IADC Australasia Chapter please visit the IADC website. 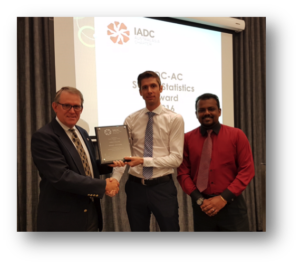 Mark Denkowski, IADC Executive Vice President, Operational Integrity presents the offshore safety award plaque to Sebastian Van Diemen, Noblecorp Drilling Superintendent and Yoga Rajan, Noblecorp Regional HSE Supervisor. Mark Denkowski, IADC Executive Vice President, Operational Integrity, presents the onshore safety award plaque to Leigh Foreman, SLB Operations Manager. On 7 June, U.S. Secretary of Labor Alexander Acosta announced the withdrawal of the U.S. Department of Labor’s (DOL) 2015 and 2016 informal guidance on joint employment and independent contractors. Removal of the administrator interpretations does not change the legal responsibilities of employers under the Fair Labor Standards Act and the Migrant and Seasonal Agricultural Worker Protection Act, as reflected in the department’s long-standing regulations and case law. The department will continue to fully and fairly enforce all laws within its jurisdiction, including the Fair Labor Standards Act and the Seasonal Agricultural Worker Protection Act. On 17 July, the U.S. Occupational Safety and Health Administration (OSHA) will hold a stakeholder meeting in Washington, D.C. to discuss the future direction of the agency’s Voluntary Protection Programs (VPP). The discussion will include comments and suggestions from the public on potential avenues for action. OSHA is seeking to reshape VPP so that it continues to represent safety and health excellence, leverages partner resources, further recognizes the successes of long-term participants and supports smart program growth. The meeting will be held on 17 July from 9 a.m. to 5 p.m. in Washington, D.C. Those wishing to attend must register by 10 July, and attendees can choose from several levels of participation in the discussion. To register, please visit VPP Stakeholder Meeting Registration. For those unable to attend in person, a docket has been opened to receive comments. You can provide input and/or read others’ comments. The docket closes on 15 September. The U.S. Department of Interior recently published a Request for Comments on how the Department can improve implementation of regulatory reform initiatives and policies and identify regulations for repeal, replacement, or modification. The document also provides an overview of Interior’s approach for implementing the regulatory reform initiative to alleviate unnecessary burdens placed on the American people, which was established by President Trump in Executive Order 13777, “Enforcing the Regulatory Reform Agenda”. No deadline for the receipt of comments on this effort has been established at this time, and Interior will review comments on an ongoing basis. IADC is soliciting input from members for submission by IADC. Comments may be submitted to John Pertgen at John.Pertgen@iadc.org. Two provisions of particular interest to the offshore drilling industry were adopted at the International Maritime Organization’s (IMO) 98thth session of the Maritime Safety Committee (MSC 98) meeting that was held on 7-16 June. The Committee approved amendments to the IMO’s Dynamic Positioning (DP) Guidelines (MSC.1/Circ.645). This first revision of the guidelines since their introduction in 1994 will better align expected functional performance criteria with technologies that have evolved since. In particular, the updates will place additional focus on the importance of formulating DP system integrity based on Failure Mode Effects and Analysis (FMEA) evaluation. This additional focus is designed to further increase DP system reliability and enhance recognition of DP operating parameters. Having been approved by the Committee, this revised guidance will generally apply to vessels on or after 16 June 2017. The Committee also adopted amendments to the IMO’s 2009 MODU Code with an “entry into force date” of 1 January 2020. A result of recommendations drawn from investigations of the Deepwater Horizon incident, these amendments will further improve provisions for addressing person in charge considerations, installation and operation of equipment in hazardous zones, providing for more robust structural fire protection design elements, and lifesaving appliance considerations unique to MODUs. The Committee decisions mark the successful completion of efforts undertaken by key flag states representing a majority of the global Mobile Offshore Drilling Unit (MODU) fleet. Actively collaborating with these countries over the span of several years, IADC is pleased to see these new DP and MODU Code provisions adopted in a manner that will enhance operational safety while not forgetting the practical considerations for implementing these improvements. The U.S. Department of Energy’s (DOE) Office of Fossil Energy recently announced the availability of $20 million for cost-shared oil and gas research project to increase recovery efficiency from unconventional oil and gas wells and prevent offshore spills and leaks. The funding opportunity seeks projects that will advance DOE’s objective to support a more environmentally responsible, secure and resilient U.S. energy infrastructure, while enhancing competitiveness and national security. The first two topics areas address critical gaps in the understanding of reservoir behavior and optimal completion, stimulation and recovery strategies for unconventional oil and gas. The aim of these topic areas is to increase and enable more cost-efficient and environmentally sound recovery from shale gas, tight gas oil and tight gas reservoirs. The third topic area focuses on offshore oil and gas spill and leak prevention. The aim of this topic is to develop innovative solutions that predict geologic hazards, and prepare for and prevent offshore incidents through risk reduction and mitigation technologies. To learn more about this funding opportunity, please visit the Department of Energy website. On 27 June, the U.S. Department of Labor’s Occupational Safety and Health Administration (OSHA) proposed a delay in the electronic reporting compliance date of the rule, Improve Tracking of Workplace Injuries and Illnesses, from July 1, 2017 to Dec. 1, 2017. The proposed delay will allow OSHA an opportunity to further review and consider the rule. The agency published the final rule on 12 May 2016, and has determined that a further delay of the compliance date is appropriate for the purpose of additional review into questions of law and policy. The delay will also allow OSHA to provide employers the same four-month window for submitting data that the original rule would have provided. OSHA invites the public to comment on the proposed deadline extension. Comments may be submitted electronically via the Federal e-Rulemaking Portal. The deadline for submitting comments is 13 July 2017. See the Federal Register notice for details. API recently announced a ballot for API 16TR1, BOP Shear Ram Performance Test Protocol, 1st Edition. This document was previously promoted as API 16TR2, but has been re-designated as 16TR1. This is a new document and the ballot results will be the basis for publication. The ballot closes on 24 July 2017. The API ballot system permits nonvoting individuals (guests) to submit comments by entering the ballot ID number, ID #4141, on the login page and then entering the required contact information. More information can be found on API’s website. The IADC ART Cybersecurity Subcommittee is in full swing drafting five additional guidelines following the guidelines published last year on Assessing and Managing Cybersecurity Risk for Drilling Assets. The five additional guidelines under development are as follows and due to be completed by the end of 2017. Please join the Subcommittee at the next meeting to participate in or learn more about the progress of the guidelines. The focus of the next subcommittee meeting is to review the guidelines for Minimum Cybersecurity Requirements for Drilling Assets. The next IADC ART Cybersecurity Subcommittee meeting will be at 9 am on 13 July 2017 at IADC, 10370 Richmond Ave, Suite 760, Houston, TX 77042. If you plan to attend, please register online at the IADC website. Robert Vankuilenburg of Noble was recently named co-chair of the IADC ART Drilling Control Systems Subcommittee. The subcommittee will next meet on 27 July at IADC Headquarters in Houston. For more information please visit the IADC website. IADC Drilling Matters is pleased to announce the addition of two new modules to DrillingMatters.org. Drilling Matters is a web-based, modular and interactive website designed to dispel myths and correct misconceptions about the petroleum industry. The first new module, “More That a Fuel” discusses the myriad products, both mundane and highly specialized, that would not exist without use of oil and gas. The 9-minute video discusses everything from lipstick and balloons to pacemakers and Xray machines, as well as sweaters, balloons, golf balls and thousands of other items we take for granted. The second new module is a wholly revised interactive rig tour. Click on one of the enumerated components and a video plays discussing the component. In all, DrillingMatters.org comprises 15 modules, from basic introductions to drilling equipment, the value of hydrocarbons, and more. Drilling Matters: Spread the Word. For more information, contact Mike Killalea (713-292-1956, mike.killalea@iadc.org). The 2017 IADC Incident Statistics Program Q1 Year to Date Summary Report is now available via the IADC website. The 5 year LTI/RCRD Frequency rate has also been updated and published. Participation in the IADC ISP is voluntary and open to all drilling contractors and well servicing companies engaged in oil and gas and well drilling. However, a company must participate in the IADC ISP program and be a member of IADC in order to qualify for rig/unit recognition. The ISP has tracked safety and accident information for the drilling industry since 1962. Data are compiled separately for land and offshore operations and for seven geographic regions – U.S., Europe, Canada, Central and South America, Africa, the Middle East and Asia Pacific. To learn how your company can participate in the ISP, please visit the Incident Statistics Report page on the IADC website. Questions can be emailed to isp@iadc.org. Last month, we launched the IADC Lexicon “Featured Term”. The IADC Lexicon (IADCLexicon.org) is a compendium of upstream-related terms, which, unlike conventional glossaries, are official definitions drawn from legislation, regulation and regulatory guidance, standards (global, national and regional), and IADC guidelines. Terms often have multiple definitions from different sources. Product or process of identifying physical features or operational attributes that render an entity, asset, system, network, or geographic area … (click to read full definition and those from other sources at http://www.iadclexicon.org/vulnerability-assessment/).